Duchess Kate: Kate in (a very familiar) Emilia Wickstead Piece For Dunedin Visit + A Casual Look for Rippa Rugby! Kate in (a very familiar) Emilia Wickstead Piece For Dunedin Visit + A Casual Look for Rippa Rugby! The Duke and Duchess of Cambridge departed for a two-day trip away from Wellington (and from Prince George) this morning for their busiest day of the royal tour yet. The Duke and Duchess were all smiles as they stepped off the plane. 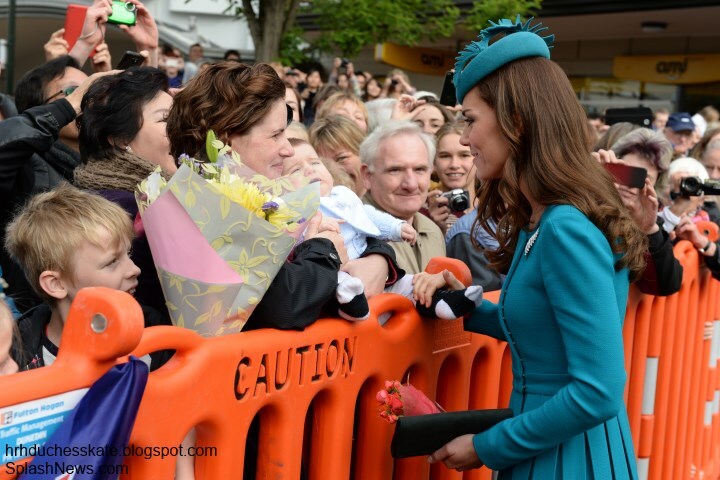 Kate hugged a very excited 5 year old upon arrival. The little girl Kate hugged also received a traditional 'hongi' welcome. The couple were greeted upon arrival at Dunedin Airport by representatives of Ngai Tahu, which is the principal Maori iwi, or tribe, of much of the South Island. The press travelled with William and Kate on the Royal New Zealand Air Force plane, and were behind the curtain in business class. Sky's Paul Harrison shared these snaps. William and Kate then attended a Palm Sunday service at the Cathedral of St. Paul. Palm Sunday is a Christian feast that falls on the Sunday before Easter. 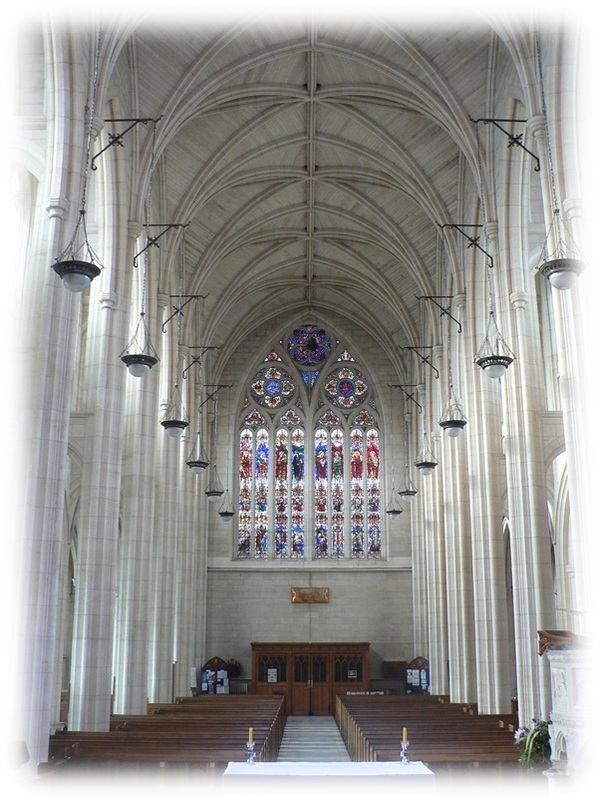 St. Paul's Cathedral is mother church of the Anglican Diocese of Dunedin and the seat of the Bishop of Dunedin. It has a very interesting history. In 1904, William Harrop, a prominent Dunedin businessman died and left the bulk of his estate to fund a new cathedral. However, release of the money was conditional on £20,000 being raised towards the cost of the building. It took over nine years to raise the money, and on 9 June 1915 the foundation stone of the cathedral was laid. As you can see the architecture is beautiful, with large piers and a vaulted ceiling. A 3,500 strong crowd waited outside the cathedral. We've been waiting to see Kate in a New Zealand designer - today she gave a nod to the country in a teal dress by one of her go-to designers Emilia Wickstead. The designer was born in New Zealand, and her mother, Angela Wickstead, ran a successful bespoke dressmaking service in Auckland when Emilia was growing up, which helped start her on the road to becoming a successful fashion designer. Does the dress look familiar to you? No, you're eyes are not deceiving you. It appears Kate's dress is identical to the pale pink Emilia Wickstead 'Alice' coatdress the Duchess wore for The Queen's Sovereign's Luncheon and The Queen's Garden Party in May 2012. Kate obviously loved the garment and ordered another one from Ms. Wickstead. It's also entirely possible the pink one was dyed. (Now that's thrifty). For the second time during the tour, Kate accessorised with The New Zealand Fern Brooch loaned by The Queen. 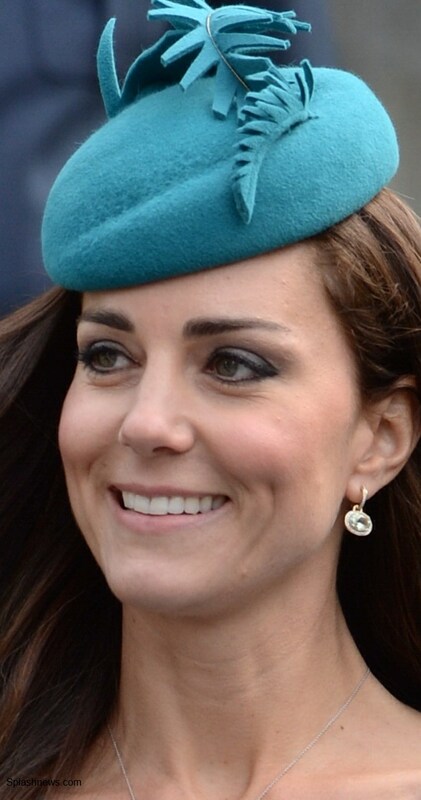 Kate's stylish teal hat is by milliner Jane Taylor. The Duchess wore her Kiki McDonough green amethyst earrings and a necklace with a silver chain. For those who enjoy Kiki jewellery, it's now available at Neiman Marcus. Kate wore her Emmy Shoes suede pumps and clutch. Afterwards, Their Royal Highnesses travelled to the city's famed rugby stadium to watch a festival of Rippa Rugby. For those unfamiliar with the sport (such as yours truly, who had to ask the other half to explain it in very simple terms) it's basically a non-contact version of rugby for youngsters in which the tags are "ripped" from the belt of the ball-carrier, rather than physical tackles being made. This puts emphasis on ball skills instead of physical prowess and allows for teams made up of both boys and girls. The Duke and Duchess each encouraged and coached a team from the touchline. Before the event William's private secretary Miguel Head said we could expect "some pretty competitive outbursts". William was very pleased when his team won 30-20. 'The Regal Rugby Fun Day begins with food and entertainment, as well as rugby. All Blacks taking part will include Richie McCaw, Aaron Smith and Ben Smith. Did we mention these two have great chemistry? Kate changed into a more casual ensemble. Kate wore the cream Jonathan Saunders Deborah Egg-Knit Sweater. The slim-fitting ribbed sweater has a round neck and long sleeves. It's sold out in cream but currently on sale in pink and blue at Matches reduced from €474 to €142. The Duchess teamed it with skinny jeans and her Mint Velvet plimsolls. To watch videos from the events check out TVNZ. They have a very nice selection and they're frequently updated. This afternoon, The Duke and Duchess of Cambridge travel to Queenstown where they will visit a vineyard, sample wine and enjoy a rafting trip aboard a shotover jet. We'll have another post covering their Queenstown visit; they're expected to arrive a 2 p.m. (3 a.m. UK time). Thanks Charlotte for all your amazing work. Ugh. I am sorry. I am a HUGE Kate fan, but this tour is lacking luster and I am getting bored. Where are original jewelry pieces, like the ones she supposedly ordered from that NZ designer? Why aren't her outfits more stunning or better tailored, yet they're expensive? Yesterday's green coat was a fashion disaster, in my opinion. It lacked detail and wasn't well tailored to her body (I feel it made her look larger and boxy). I LOVE this turquoise color on her, but the dress looks like it is half finished (like the pink one, and reminiscent also to me of the dress she wore when William joined the Order of the Thistle). Buttons, perhaps? You can see the stitching for the hidden snaps, and that stitching needs something over it. Also, that hat looks like a DIY craft project gone wrong - you know, the ones that seem like a great idea in your head and then don't turn out very well. The fern is a nice nod to NZ, but looks like it was awkwardly glued in a few places. Of course, it is important that you are bored, and that certainly should be a factor in HRH's outfit planning. I'm sure she would be most upset to discover that you find her extravagant -- yet not stunning or even well tailored. And in fact the perpetrator of fashion disasters! Also: not enough bling. One thing I do question: how can you be so sure (vis- a-vis The Queen Mother) that the Duchess is not doing her best? If I were you, I would be prepared for further disappointment. ANON 1:53-----thank you thank you for responding with such gusto! Excellently put.....I am still smiling over it. I feel like it lacking luster too. That doesn't make me happy as I was excited for this tour. The only outfit that gave me a thrill was the McQueen coat and pony. Everything else including their event chooses (no evening gowns) has been blah for me. And before you attack, everyone is allowed their own opinions. ANON 1:53 THANK YOU!!!! Very well put!!! It was definitely time someone said something!! ANON 1:53- THANK YOU!!!! Something needed to be said!! I'm ANON 00:38 and I'm glad you all felt the need to gang up and internet bully. Several other posters below have commented on the same PERSONAL opinions with EW's designs. Some have also commented on the hat (one thought it was damaged). This blog's tagline is about following the "Life and Style" of Kate...STYLE. Therefore, I think it is safe to say a lot of us have an investment in her style. It was my opinion. You can post your opinions, but please don't tear apart someone else's opinions. Take care. Please note that this is a fan-blog. It is for followers of the Duchess of Cambridge. It has been said previously by many people who post here that they prefer it when people select their language and avoid negative describing words. I do not understand how words such as "fashion disaster" and "lacking lustre". can be applied to the style of a young royal who is clearly doing a fabulous job. She is not a fashionista, so she cannot have "fashion disasters". You will not see clothes worn by the Duchess that are the latest fashion. You will see this type of clothes that she is wearing, timeless, classic pieces by high-end designers, with some casuals thrown in. You are allowed your opinion, but please note that if you choose your words a bit more carefully, you probably will not have so many people jump at you. I am neutral in my opinions of Kate in general but after months of no work the tour seems pretty light and all of the events are in the neighborhood of 40 minutes. I too am bored and disappointed. The one bright note is Kate has obviously been talked to about higher end designers and lower hems. That part works and it also should silence those who insisted there was no truth to the rumor that Kate was talked to. The problem is she still resists using a designer and keeping her weight steady for the fittings to be meaningful. If you remember after the Yorks outfits at the wedding they started using a good stylist and have been outshining Kate after that. I am hoping she can turn it around but if she has another kid then another year off for maternity. If you take a look at young Prince George, it is obvious that Catherine has done a bit more than "no work". Whilst she has not been seen out in public as much as previously, she has dedicated time and effort into being the perfect mother to her young son. She did say to someone that Prince William had been away a lot, which also explains why she has not been doing as many engagements. This is a dated complaint, so I won't go on about it. But the happy, contented little boy is proof of what Catherine has been up to: Motherhood. And that is a good thing!! The original commentator wrote she truly loves Kate so why is someone lecturing her on this being a fan site? Style is half of this blog so expressing personal preferences on clothing is expected. It is fun to read everyone's reaction to the outfits. Saying that a commentator who does not like an outfit of Kate's is automatically not a fan, also says Kate is only what she wears. The Yorks are "outshining" Kate? You have got to be joking. According to Jane Taylor, this hat is custom made. The dress looks so much better in teal---- but so far for me this has been her worst tour (just talking about fashion). Totally agree, the teal color is beautiful. Agree about the fashion too, it's been ok,nothing major wrong with it, but rather boring overall. I just realized that all of my favorite fashion moment for Kate have been during warm weather. Their Canada tour was during July, their Southeast Asia tour was September, and then there was all of her loveliness during the Jubilee and Olympics during the summer of 2012. I don't think any of my favorite looks of hers involve a coat--perhaps why this tour seems a bit lackluster? its also been colder and wetter. I really think this makes a difference because of the need for coats. One look at my wardrobe says it is duller in the autumn than it is in spring/summer on warm days. I agree, this tour has not been her best fashion choices. She needs a stylist big time... Disappointing she bought this dress in two different colors. Tacky. HRH looks really chic! Her milliner gave a nod to NZ with a felt fern -- nice touch. I noticed that too! Very classy! I think she looks amazing an very happy to be where she is. The dress is a hit- first rate and the color----well I haven't seen her in any color that isn't just beautiful. Love the hat and the nod to NZ with the fern. Of course she would be wearing a hat since they attended church services. William looks very dapper- I would love to see him in a black suit- just to change things up a bit. Charlotte, you continue to out-do yourself. Thank you from the bottom of my heart- I worry about what we will all do when the tour comes to a close. I also thought the "feathers" were to represent NZ ferns. But I wonder why the brooch wasn't worn in Auckland. Didn't their ladies give it to the Queen? Otherwise, I loved that dress in pink at the garden party, but thev teal is great with her coloring. Those kids sre precious and Kate does so well with them. Charlotte, did you notice at the end of the comments for your last post (00:06) I mentioned the story in the NZ Herald. It is a lovely story and states that Catherine wanted to stay at Rainbow House, but security was getting "tetchy." That is very interesting. They are running a little late today and their team/security are very keen to keep things on schedule. You are fast, Charlotte! Love the post, and really appreciated that you wrote a little background about the church, as I had been wondering. Kate's look is an A+ today in my book. I'd seen a twitter that she was wearing her hair up, and was looking forward to seeing what kind of up-do she had, but that obviously turned out to be wrong. I do love her hair down, too, so it doesn't even matter! She looks gorgeous! Favourite tour look so far!!! I love Kate, but I find it very odd that this is the first NZ designer that she is wearing and she actually lives in the UK. On her 2 prior tours, it seems she did a much better job of showcasing not so well known local designers like Erdem, Raoul and others. I get that she does not want to be known for her fashion, but by wearing little known designers she actually gives that business quite a boost that they would not normally get. There are probably plenty of NZ and Aussie designers that are praying she wears something form them...seems kind of a snub to not do so. Also, if she does not want to be know for what she wears, it would probably help her cause to be seen out working more often. You read my mind Melissa. I wonder too if the Duchess is consciously pulling back the reigns in the fashion area so as not to be known for her clothing? I would love to see her in some unknown designers and wonder if this approach will backfire as some fans might lose interest? I too would love to see her speak more often. Wouldn't it be great to my a fly-on-the-wall in the Palace to understand what strategy the Duchess is taking? As always, she does look beautiful. Maybe the creations of NZ designer are not to her taste. Well, the NZ part of the tour isn't over yet. The concept of the tour wardrobe seems to be colour block-simple-elegant. Not sure yet what to think about it ... But Kate, again, looks absolutely beautiful. On another note, a recommendation for lovers of vintage style dresses who look for an every-days alternative to Suzannah. Check out http://www.peopletree.co.uk/womens/dresses. Sustainable and fair trade fashion. I haven't ordered anything yet, but the prices are out of this world cheap. You raise an interesting point, if Kate does not want to be known for her fashion, just what does she want to be known for? She doesn't give inspiring speeches motivating people to action or joining causes. She's not a leader in philanthropy, rallying finances and speaking publically about the need for it. Right now she's really just raising awareness for the travel industry and doing product endorsements for the smarter Kiwis. Obviosly meant to say I like this Wixted style ... it is perfect for all church occasions. Maryland Moxie - I too think it is strange how she has no voice on anything. She rarely speaks or gives you any indication about how passionate she is about any of her causes - besides one PSA for hospice care. We constantly hear how she does not want to be known for her clothes, but she does little else to be known for. Are the merry wives of Windsor forbidden from making their opinions known? I'm sure the patronages that she has have all gotten a boost from her, but I just keep waiting for her to become more human and really let us know what she is about. I think that is why so many people related to Diana - she knew she had a voice and used it to the fullest all while looking fabulous too! If you look back on Diana's life as a young mother, you will realize she did not do a great many public appearances, nor speak out; and most of her clothing was not high fashion. After her separation from Charles, she did use her celebrity for causes dear to her and dress in a more sophisticated way. I find Kate quite human and charming, and not needy or self- destructive as Diana or Fergie. William chose well. I agree but if she doesn't want to be know for fashion she needs to step up her charity and public appearance visits to be taken seriously. In fact, she is the wife of the heir to the throne and needs no other raison d'être. Maryland, tell us more what a wixted style is. I agree with your comments Maryland. I think there is a fascination with Catherine and that has transpired with the public through her style. People are curious and what to know about her and the only way people can do that is through her fashion choices (and it's fortunate for her that she is so thin that all clothes look good on her) because there is not anything else she is known for. It's a beautiful dress, but I'm really hoping we see Kate switch up her clothing choices a bit on the tour. She's definitely going with brighter colors now lets see some different dress styles. Kate looks great. I really liked the pale pink Alice coat dress so this one in teal is a winner for me as well. I have had an issue with the sewing/finishes of some of the past garments of Emily Wickstead but this dress looks well made. Accesories were also well choosen. I love this hemline and as a young woman with great legs I prefer to see Kate wearing dresses to the knee which I view as perfectly approriate rather than seeing the same hemline on Kate that is worn by the queen who is a woman in her late 80's. In Cambridge, William was introduced to the lady who made the NZ Government's present to Prince George on his birth - a handknitted shawl using NZ wool and featuring ferns. She is reported as saying this morning that William said to her "You might have to make another one soon" and another baby is now being extrapolated from that! Kate also spoke to her and thanked her for the shawl, apologising for not having had occasion to use it yet here, though they had brought it with them from the UK. The New Zealand Herald website is good for information. Saw this too, but like that walkabout during Kate's pregnancy when a lady thought she heard her mention a daughter, I'm taking this with a grain of salt! I just read the same. Surely they wouldn't have started trying just before the tour when Kate got so sick last time? It's a 24-hour flight back to the UK, even aboard any type of military medical aircraft, if she was to suddenly become ill - as she did the last time. Certainly she would be treated at a local hospital wherever they were but she still would have to get back to the UK. And that's a long flight for an expectant mother who's healthy, let alone one who has fallen ill. I just don't think she or William or the Palace would take that chance. And as you mentioned, 2:14, I don't believe they would risk her getting sick while on tour. Large, large grain of salt with all the pregnancy news. I will believe it when I see the stand put out by the Palace press secretary in front of Buck House. Linda Hart, Thank you for the suggestion to read the NZ Herald. It’s nice to read the quotes and details. I just read a piece there about Kate’s visit to Rainbow Place. It was very touching and even mentioned that the press was whisked away in the middle of the conversation she was having with the young girl whose mother had terminal cancer. (So, any quotes from that conversation were only from the beginning of it). Also, at the end of the visit with the children, the Duchess wanted to keep talking, but security was looking touchy, like they wanted her to leave. There had been some comments criticizing/questioning her for staying too short of a time there, but it looks like it wasn’t her decision to leave when she did. Apparently the woman who claims William has said that William said she would have to make another one "sometime" not "soon" so I'm guessing someone misheard what she said and started the rumor, as before with the daughter comment supposedly from Kate. If she were pregnant she wouldn't even bother going to a wine tasting, the palace would have scheduled something else for that day. Catherine looks absolutely stunning in this ensemble, lovely and appropriate for Palm Sunday. Chic is a very good word to describe her today, thanks Anon 00.40. What an exciting day ahead, bet they will sleep well tonight! Also love the traditional welcome with Catherine and the little girl. Just gorgeous! to me, that was just Kate being Kate! It is a wonderful image that I predict will become one of the iconic memories of the tour. We'll see that photo again and often. I do love the color I like the way it flatters for skin tone. but in all pictures but one for hair covers the brooch! Best look of the tour until the moment. She looks lovely. Love the hat too. But I must say I'm quite disappointed that she's repeting former dresses. I can't quit smiling! How many times have I loved a garment so much that I bought the same one in a different color, too? I would never have expected the Duchess to be as preferential about one dress' fit and effect though. I think it's a second dress altogether. I have little experience with garment dying, but wouldn't you think it difficult to get a perfect tint to every centimeter of fabric, including seams and pleat folds? Could they have dyed the metal hooks on the top of the dress, too? I hope she still has the pink one and this is another version - love the pink color! I sure don't mean harm or to be rude but somethings not right with mates clothes.ive never in my life noticed this on anyone.some of these dresses look patched together cheaply and too long. And far away it looks awful and like polyester. Doesn't she pick her own style I hope. Oh lord who would let her look like this? There great, a good team together, but since queen wanted longer hemlines her clothes look old for a beautiful young women. I love her hats and accessories. Today teal dress you see the hooks. Someone needs glasses like the seamstress maybe. I love Emilia Wickstead designs and they have always looked pretty on Kate giving her a more feminine silhouette. I adored the pink and I like this colour too. As for the eyelets/hooks, they are part of the dress's design, not a fault of the dress (and they are blue). They are designed to be seen. Check the obvious neat hand stitch on the outside of the bodice - it's supposed to be noticeable. The fabric looks like a wool crepe (not cheap). The length is suitable for her figure and church. NZ is supposed to be cooler this time of year compared to what weather they have been having. Kate came prepared for exactly that (cooler climate), except we are still dithering in a milder climate for some unknown reason. This is why her usual florals and lighter dresses aren't dominating the tour. Most of her brighter dresses I think are saved for Central Australia, Brisbane and perhaps Sydney. Sunnier, warmer climate. Bear in mind many of the events so far have been quite official in nature requiring less drama in her clothes. The boxy reference so many make is simply due to Kate's figure. Some clothes will emphasise this. I'm not minding any of her choices up to date. And I think we need to look at how she and William are engaging with the public. Mature but with a streak of fun. Thanks Anon @ 2:57 for your remark on the Wickstead design elements. I have been watching her work for many years and I totally agree. Like your very considered comment. In order for the hooks to hold the front closed properly, the stitching has to go through all the layers of the fabric. This is part of a designer trend toward less-fussy couture. . un-finished edges. exposed zippers, large snaps or hooks without decorative buttons, etc. Meant to also say I love the teal color and dress length. Not the dowdy longer dresses below knee. She has beautiful legs, why not show them. She's had one child, her body probably has changed, maybe an expanded ribcage and pelvis; but I think she looks very thin. I'm sure she would not risk the first trimester on tour after her terrible morning sickness last time. Can't decide if William was telling the truth when he said "one's enough for now" or when he dropped hints about blankets. Anonymous 02:11, I don't think it's damaged. If you look at the pictures of her hugging the 5 year old girl, it's part of a longer "crease" that goes around to the back of the hat, too. But I can see how you thought it might be, from the pictures from the front. I liked the Erdem coat and I like this dress as well in teal as I do in pink. Important I think to remember that before her marriage, Catherine was a conservative dresser, favoring classic pieces. She certainly has the height and slender figure for haute couture but maybe she's not comfortable dressed that way. 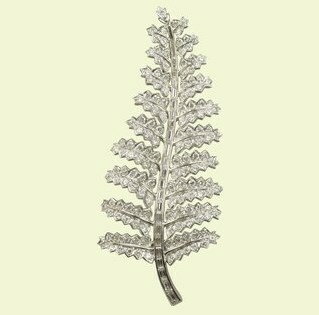 And while she is honoring her host country with the fern motif, in fact she is expected to represent the best of British fashion, period. Picking an Aussie or Kiwi designer is a bonus. I think she's doing a great job with the clothes on this tour, aside from the hideous gold buttons on that red coat. And she and William are winning hearts, which is all that really matters..
How would you explain the Tory Burch dress? American, not British or NZ. Who expects Kate to solely represent the best of British fashion? I think she more broadly represents the best of Britain because she is British. Otherwise I enjoy seeing Kate have fun choosing designs she is simply drawn to. Why csn't George come too? He has a nanny. This dress is a big EH for me. I never really liked the pink version. Like most of EW's designs, I always felt there was something off about it (and this version seems to have been finished poorly - all those hooks showing from the side!) To see the style repeated is a bit disappointing for me. At the very least, I wish there had been more detailing added on this go around - buttons, braiding, cut work...something! I know this designer has a kiwi connection, but given the general lack of local designers and focus on favorites so far, I find myself wishing for a little Temperley. Something interesting. Something beautiful like that blue dress with white overlay from the last tour. All this unadorned color blocking isn't exciting in the least. I've decided I don't like autumn tours. I'd rather see dresses than coats. We see enough of that in the UK. I really like Kate in this ensemble. It suits her hair and skin colour really well. I agree with some of the other comments. I love this colour but the unfinished look on the front of the dress doesn't really blend with the class and elegance of the overall design. I think it takes the focus away from how lovely it really is when you cannot look past it. However, this could be part of what the designer wanted. Trelise Cooper (big NZ designer) often has a bit of an unfinished edge to her clothes too. Perhaps if they had placed a false placket down the front like they do when they hide buttons on some coats it would have given it a better finish. Kate's causal outfit at the rugby game is perfect! I do like the demure dress she wore for church. The color is gorgeous and the dress very appropriate. Wonderful picture of her hugging the little girl. She's getting much more confident with the hongi greeting. Boring - solid colours again, tone on tone.... where is her own stile? what happen to the girl who had flair and good instincts? Maybe she was "reigned in." She really needs a stylist. End of discussion. Love this dress in teal and loved it in pink. My only gripe with both dresses is - for such an expensive, bespoke piece, WHY is the front tailoring so awful and cheap-looking???? It was on the pink dress and it is even more noticeable on the teal one. I can't figure out why a designer as skilled as Wickstead is with her other pieces chooses to put those awkward hook-and-eye closures and the corresponding stitching in such an obvious and awkward spot on this piece. The stitching almost looks like somebody forgot to add some embellishment or removed some to the front of the dress. There's a similar dress sold by Hobbs, that I purchased last fall, that has the same design with the inset belted waist and a nice back, covered zipper. Otherwise, great choices today and, again, it reaffirms that Kate and William, but especially Kate, do their best in informal, casual settings where they can interact with people on a more chatty, casual level. I really hope we'll see them taking on a more active, busy public schedule once they return to the UK. This tour has proven, even a few days into it, that they are certainly capable of a full-time schedule of duties AND being hands-on parents. I think an equally busy schedule once they return to the UK would go a long way toward repairing the damage done with the recent no-work, all-play/vacation schedule they seem to have had. I've got mixed feelings about the hysterical pregnancy rumors, even given William's comment about the second lace shawl. I have a tough time believing she is pregnant simply for the fact that she was dreadfully ill during, at least, her first trimester - and throughout the pregnancy from most reports - coupled with the fact that this is an arduous tour with a tremendous amount of flight time and physical activity, not to mention being in the air for what amounts to 48 hours round trip to get there and back to the UK. I just can't see that Kate would take that chance with a pregnancy. I also can't believe she - or William or the Palace - would take the chance that she could suddenly become ill during the tour, as she did the first time, which prompted the earlier-than-anticipated announcement. I would expect that they may be trying for a second baby or that they plan to upon returning to the UK and that we may see an announcement in the early fall, since that would put roughly a year between PG and a new arrival. I've read multiple reports that the royals prefer summer births, since it's traditionally a slower time for them and they can retreat to their country homes, as Will and Kate did after PG's birth, to recover. If she was pregnant now, that would put the birth close to the Christmas holidays and the festivities at Sandringham. I just don't see that happening for various reasons. And yes, I know that Zara was just days away from giving birth but consider that Zara is not a senior royal as Kate is. Anonymous, I'm just saying I don't believe they would take that chance that she would get sick while on tour. And I think we're all adults here so we know that nowadays, couples have quite a bit of control over when they're able to conceive or not. It sounds adorable to say that Will and Kate make their own rules all the time but the fact is they don't. They are governed by rules written and unwritten that govern how and when things can be done or not done and down to the last detail. Yes, it's true that some things have changed since Diana but many, many things, including protocol and the royal do's and don'ts, remain the same. Common sense dictates that for Kate to be pregnant now would put her health and the health of the unborn baby at risk, with the travel, the distance and the activity, and why would she do that? As Charlotte mentioned in the updated post, I think Kate sipping the wine puts the pregnancy hysteria to rest. At least maybe for a couple of days. One word. Boring. That dress is a shapeless mess. She really needs help. I don't understand why she does not have a dresser. The fact that these clothes don't fit her good and you notice things like "hooks" tells me she does not have a clue about fashion and what looks good and what doesn't. The Duchess is attending church. The hooks and top stitching are found on some high end designer pieces. I have a Donna Karen cashmere long coat that has this exact look of stitch on top on hook placement. It is from the 90's though. I think a stylist would take her to the next level though, Even a different shoe would make a difference. Her hair styled differently, anything to break up the coat and long hair look. They do look so very happy and New Zealand looks beautiful. They look like they are enjoying it which counts for a lot. I couldn't agree more Milo! I have a little suit by Colette Dinnigan from the 90's that has hooks, no buttons. It is a classic outfit that looks really "smooth". Unless you stick a camera into the stitching of the clothing of course. Then everything looks odd. Why photograph her like that? I do think it is a new dress, not dyed. Why go through such trouble? The pink one was gorgeous, and I hope to see it again. Kate looks stunning! I love her blue outfit!! I love her hat and I love the sweater she is wearing on the field. Thank you Charlotte you are making everyone's day! As far as hooks go, that photo is a very close up side view. Not your usual presentation. I have a theory that this is the pink dress and it has been altered, with the hooks and snaps having been set over. It is still a little snug in the top and this may be why the hooks seem strained. She originally wore that dress before she was a mother. The hooks could easily have been replaced with blue ones in the process. Again, Kate hit it out of the ballpark! Fabulous color and perfect design. I love that her hat carries the fern theme of the Kiwis! I love that picture of her and the little girl hugging. So cute. Beautiful, simply beautiful. Kate looks stunning in the blue Emilia Wickstead. I love the picture of her hugging and greeting the child. And the picture of Will and Kate laughing...so sweet! I think the tour is improving as they go. They are warming up to the people and the people to them, and that is the bottom line. Listen to the NZ news casts! They are just gushing! I haven't heard or read a negative word! And they are enjoying the time of their life. I'm loving watching this. Kate's wardrobe is perfect for New Zealand autumn which as everyone probably knows -- they are going into winter down there. Boy, does that look like a walk down memory lane? So reminiscent of their university / courting days. Would love to see more of this! I simply love the pictures of William and Catherine together at the rugby. Especially the close up. Such a gorgeous couple! I loved the casual rugby outfit but why no mention of the stylish sneakers? I believe those are Campers, a personal favourite brand. The EW dress was a miss for me as well. Not terrible but just not my favourite. I really didn't like the hooks. It seemed too similar to the McQueen coat from earlier in the tour but just not as good of a fit. I loved the casual rugby outfit. Why no mention of the sneakers? I believe those are Campers. The EW dress was a miss for me. Not terrible. I'd love to have a bad fashion day like that. But just not great, and too similar to the McQueen coat earlier in the tour with a worse fit. The hooks bugged me and just didn't seem polished or deliberately unpolished enough. If someone looked at me the way Catherine looks at those children, I would feel like the most important person in the world. A moment they will be telling their grandchildren about..maybe when George is king and she is the Queen Mother. Ok. I just realised what would have to happen for George to be king Don't want to contemplate that. Also Will and Kate are the same age I think it is presumptious to assume Kate would be queen mother. The Queen usually wears a solid colour so that she can be seen in the crowd.... I feel for Catherine... If she goes high street she's not dressing fancy enough... She wears top designers and the workmanship is criticized.... She does not have a lady's maid which saves a lot of money but she is criticized .... I can just imagine the commentary if she did buy all top designers and had a stylist and lady's maid.... I am enjoying the pictures so far but that's just me...great work on the posts. 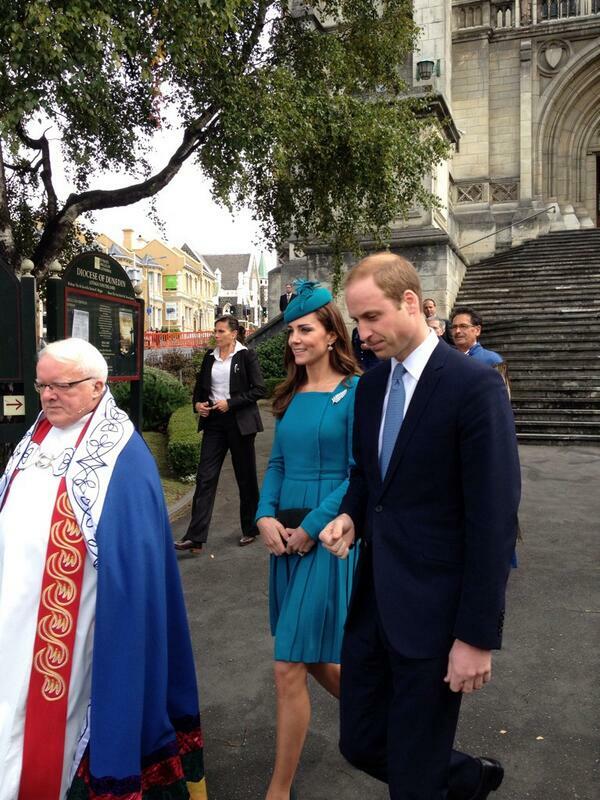 I think the dress the Duchess of Cambridge wore to church was the most disappointing of the tour. As one of your wonderful photographs shows, the stitching over the hook and eye area is very obvious and could have been covered with some sort of panel. As it is, I believe it looks unfinished and almost amateurish. May I also say that I loved the hat she wore when this dress was in pink. I loved all her other outfits, including the green coat. I am so disappointed the Duke and Duchess are not visiting Western Australia. I have replied further up the post to anonymous @ 2:05 as to why her dress is as it is. There are no faults with the design or sewing. It is actually immaculately sewn and fitted. Despite it may not be to everyone's taste can we Please Stop "The Dress is not Not Professional or Badly Sewn" rant! everyone has an opinion and many like professionally well made clothes. They should be allowed to express that opinion. Why the same dress just different color? I think she can step it up. Love her, but a bit more excitment. It must be said that Kate is not a housewife. She married a prince therefore became a representative of the UK. I do like her and I do think she is a great partner for William. I just wish she would put more of an effort in her dress and take a more active role in public events. Most working mom haven't taken as much time to stay home with their babies. Spending 30 min. at an events once every few months in my opinion is not enough. I want to buy Kate some new jeans. I´m a great "Kate"-fan, but I don´t like these dresses where the lower part is pleated and the waist is too "high" in order to make her legs look longer. It ALWAYS looks as if she´s somehow grown out of that dress and that´s why the waist is so high up. Her usual (very) high heels totally do the trick for me as far as her legs are concerned. The pleated dress probably should give the impression of more "fullness" around her hips and thighs, where she is really, really, tiny and "narrow" and so balancing the silhoutte, but for me, it doesn´t work. I prefer the "slim looks" with fitted clothes much more, but that´s "just" my personal opinion. I just love the way she looks at the moment, happy and at ease and obviously thoroughly enjoying every moment of this tour.... And I love her colour choices, looks really good with the colour of her hair...(her hair is another thing I like during this tour, it really looks radiant, shiny and lovely). This used to be my favourite site, where people discussed her clothes pleasantly and showed interest in the charities. Now it is one of the last places, because so much of the criticism comes over as hateful and vindictive. Charlotte works hard and gives great info---but some people ought to realize that the tour is not arranged for them, nor even for the Duke and Duchess, but for New Zealanders, who seem pretty happy with it so far. I really like the teal colour on her! Makes her look vibrant. I like it better than the pink, personally.Ther colour of her dresscoat reminds me of the gorgeous Jenny Packman she wore a while ago. I have to say I am more a fan of the Duchess's casual outfits than most of her formal ones (with the exception of some of the wonderful gowns she wore). She has a real knack for dressing comfortably and casually without looking frumpy. Wow. I love that colour on her. Very pretty. She should go for it in the future. Suits her very well. Actually I like the teal one better than the pink one. I also like the fact that she wears bright and beautiful colours which are also adjusting to the season in New Zealand. Her shoes seem somehow greenish in the pictures. Are they the ones she wore on St. Patrick' Day? Many thanks to Charlotte for another great post!! She looks fabulous and appropriate at each event. That pink EW dress was beautiful and timeless so I can see why she liked it. Lovely, just lovely! I also like her thoughtfulness and practicality at wearing trainers to the event with the children! She does try to put thought into her choices and I think is trying to make an awful lot of people happy besides herself. If it was not your favorite, oh well, but I think she looked terrific. This is my favorite look on Kate so far, and it appeared that Kate felt comfortable. Princess Diana always looked like a lady, and Catherine did a good job on that here. She needs to run to get rid of those immodest skinny jeans. I love this look of Kate. She looks stunning! I don't usually comment but I wanted to give my opinion. Firstly we were, you could say, for warned that this was going to be a casual tour no black tie events, tiaras, or lots of royal jewels! That being said I have not been dissapointed I love Kate's style casual or black tie and this tour has simply given me more inspiration for my wardrobe because it is a little more everyday! On another note I'm not upset with Kate for not doing more public engagements. She is a mother to a young baby and a wife to a husband who is working and away often. Royal or not she has the right to the respect we give all mothers and wives who stay at home with their children! Charlotte amazing job covering this tour you don't know how much we all appreciate it! I love that Kate recycles her outfits. But, with all the choices of clothes to wear, wearing basically the same outfit twice within a couple days on such a high profile week seems to much. I have never commented before but I have been so disappointed in so much nit picking and negativity about Kate on this tour. She honestly cannot please all of the people all of the time and having watched a great deal of the video footage of the visits I really can't see why people are being so critical. IMO she has looked completely polished and has appeared in appropriate and well thought out pieces. Unfortunately with today's technology the clarity of the images produced makes it almost impossible to hide anything and not many of us would pass the sort of criticism being thrown at her. She has appeared bright, happy and totally enthusiastic and I for one think that she is doing a great job and hasn't put a foot wrong.